Independence And The Journey West! Independence, Missouri holds a special place in my heart, and not just because I adore its downtown German restaurant (read about my favorite spot for Black Forest cake here). So much of my family history occurred in and around this spot near Kansas City, and while much of it predates myself, it holds that weight of history which I cherish whenever I’m in town. The historical significance of Independence is much greater than my own family’s experiences, however. It was from this town, named for the creek where the Lewis and Clark expedition celebrated their first July 4th west of the Mississippi, that innumerable migrants, settlers, and pioneers launched their journeys west to the new lands of Oregon, California, and the city of Santa Fe, all chasing after the promises of wealth, happiness, and a fresh start. 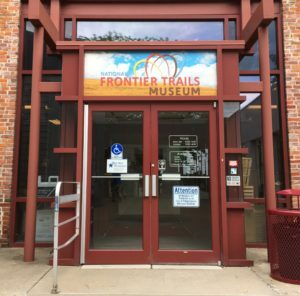 Commemorating this incredible launching pad of western expansion today stands the National Frontier Trails Museum, built between 1989-1990, and incorporating portions of the old Waggoner-Gates Mill. 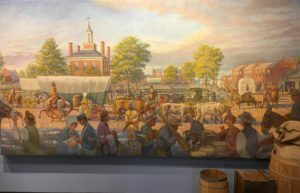 I visited the museum recently and was taken by how it manages to be at once simple and yet profound, a testimony to the central and yet fleeting role this city played in the establishment and creation of the western portion of the modern United States as we know it. Immediately inside and to the left, one finds the theater in which a video explains the central role Independence played after its founding in 1827 as a launching point for the Santa Fe Trail (begun in 1821), and later for the Oregon Trail and wagons headed to California seeking agriculture and gold in equal measure. What had been a sleepy village of only a few hundred souls would soon swell into the thousands with the annual waves of migrants headed west. Independence was the place to be if you had supplies to sell, or needed to buy almost anything for your journey! 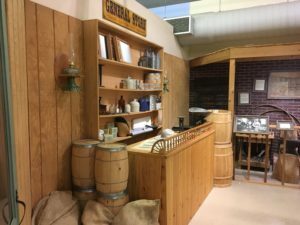 A recreated general store illustrates the types of items aspiring settlers would barter, trade, and purchase for their journeys, paths which, sadly, would claim many thousands of lives as accidents, poor weather, unfriendly natives, and other dangers would simply prove too much for the weaker travelers to handle. Indeed, the journey was less than comfortable for most, with covered wagons being the primary mode of transportation. Well-worn, yet wholly uncivilized trails formed the only paths west, diverging toward Santa Fe (900 miles), California, or Oregon (2,000 miles) depending on ones destination. 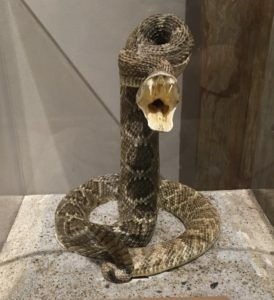 Along the way, settlers and prospectors faced everything from devastating storms and floods, to desperate heat and thirst, not to mention the natural dangers posed by disease and venomous snakes. 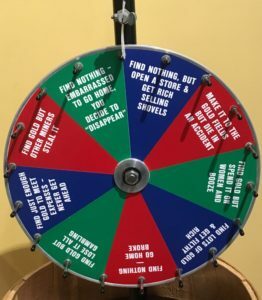 One display that I found particularly interesting allows visitors to spin the wheel of chance to discover their fate as a traveler headed west from Independence to California. By the narrowest of margins it appears that I would have been unsuccessful in gold prospecting, but would have made my fortune instead as a shop keeper selling shovels to other aspiring prospectors! 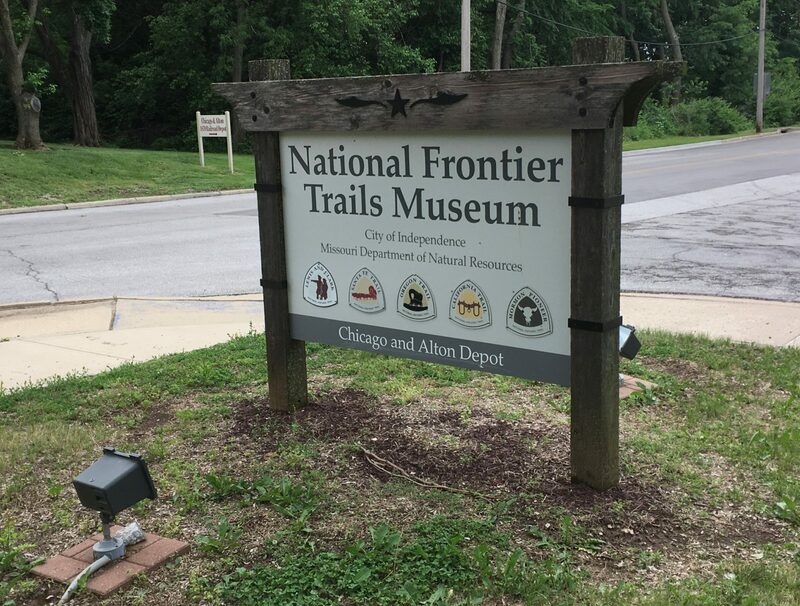 Travel Tip: If you go, the museum is located at 318 West Pacific in Independence, Missouri. It’s hours are Mon-Sat 9am-4:30pm, and from 12:30pm-4:30pm on Sundays. For more information on admissions and special events, call (816) 325-7575, or visit the museum website at www.ci.independence.mo.us/NFTM. 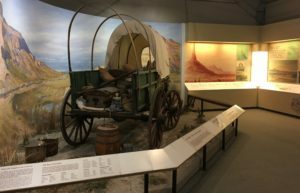 The story of America’s west coast is wild and beautiful, terrible and tragic, but however one sees it, for millions of Americans, their families’ stories begin in Independence, Missouri and the trails West. The National Frontier Trails Museum therefore serves an invaluable role in preserving and presenting that history for the present and future generations! 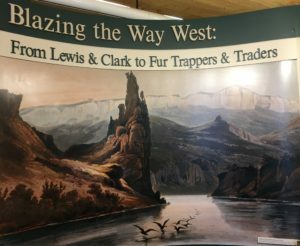 Have you ever traveled the Lewis and Clark trail as it winds its way West? Do you remember playing the old pc game The Oregon Trail? How do you feel about the massive migration of settlers west to Oregon and California in light of today’s political and social discussions on immigration? ← Hjemkomst Center: Prairie Vikings! Thanks, Prairie Man, for this post! I share your feelings about Independence. You made historic Independence and the modern day Independence sound exciting and worthy of a visit. Good job; great info!! Great article! I forget about These places from my younger years in American history. Thanks for the education! !